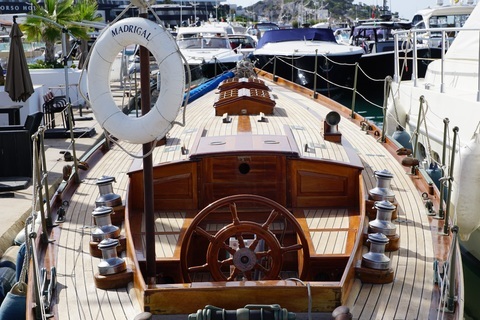 With the arrival of good weather, many of you are interested and ask to sail with pleasure boats, but, what should be done to be able to govern a boat? In todays post we will talk about the course of Pattern of Recreational Boats or PER. So, what is the Recreational Craft Skipper or PER course? The course of Skipper of Recreational Craft or PER is a nautical titulation that allows to patroll recreational motor boats up to 15 meters length, with navigation in an area between the coast and a line parallel to the same, traced to 12 Miles of it. It also allows navigation between the islands of the Canary and Balearic archipelago and nautical or water bikes within their limits according to their technical characteristics. What should be done to get the PER title? Accreditation of a specific medical examination. Find out how to do it through our collaborators. Carry out security and sailing practices for 16 hours. Training course in short-range radio operator of 12 hours. And if you want to sail, you must comply with the above mentioned requirements and carry out 16 hours of sailing practices. If, in addition, you want to obtain the title of PER with complementary attributions, such as the 24-meter length and navigation between the peninsula and the Balearic Islands, you must comply with the above requirements and carry out a additional 24-hour practice in a nautical school or academy and on an approved boat. The examina is a test with 45 questions. The maximum number of wrong questions is 13 and the duration of the examination is 90 minutes. Which types of PER courses exist? The YachtPoint Nautical School is proud to offer three types of courses to obtain the PER nautical qualification. This is a course in our school located in Port Vell in Barcelona. The duration of the course is 16 hours with different daytimes ( weekends, weekdays, mornings, afternoons,…). You will have access to our virtual classroom and you can get in touch with teachers 24 hours a day. It is a theoretical course through the internet to obtain the PER title. It is done through our virtual classroom, without hours and with accessibility 24h. You determine the rhythm. This course includes 1 hour of face-to-face tutoring and an online tutor to solve any questions you may have. It is free for all students who practice with us. This new and innovative modality is totally different from the rest. The student will embark with us for 6 days and carry out the theoretical program and the practical classes of safety and navigation on board. The day is divided into classes of theory, practice, rest and leisure. At night we moore to the port or anchor a cove. It also includes access to the virtual classroom. Our skipper-instructor is a qualified merchant mariner with extensive experience in navigation and training. These are official contents. If you want more information about the basic maritime training, you can visit the section titled sports. And this is all about the title PER. Remember that if you want more information you can contact us and we will be happy to help you.